Théodore de Banville, a fine poet much undervalued these days, wrote his Rondels composés à la manière de Charles d’Orléans in July 1875 and dedicated them to Armand Silvestre. There are 24 of them in the set, and La nuit is the second; it is also one of the more serious of the poems. (Banville was one of the poets most favoured by the young Debussy but his many settings of this poet were not drawn from the Rondels.) Chausson set the poem as a duet for two women’s voices in 1883, but it was Charles Koechlin who proved himself the real Banville fanatic. There is something quirky (and very often amusing) about the Rondels which appealed to that equally quirky composer; between 1890 and 1899 he set no less than three sets of them (23 out of the 24 poems) including the well-known song Le thé. In 1899 Reynaldo Hahn set twelve of the Rondels; in his set La nuit is the ninth song, set as a choral trio for sopranos, contraltos and tenors with piano. The very opening word ‘Nous’ suggests a duet, and one should perhaps not be amazed that Chausson was as skilled as he proved to be in writing for the medium. 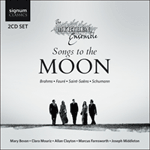 This is yielding music of mellifluous charm, accompanying semiquavers (and later quavers) spiral downwards to denote sunset and repose. The vocal line is all wafting euphony, often in thirds between the two singers and containing pleasing touches of imitative counterpoint. The key is a soft and unctuous A flat major which moves through various chromatic stages (the second verse begins in G minor) until the opening melody is restated in A major. For this Chausson inserts another appearance of the poem’s two opening lines. The return to A flat major/minor (at the beginning of the third verse—‘Pale songeur qu’un Dieu poursuit’) is accomplished by a swooning pivotal modulation; the semitone slip from one key into the other creates a mood of luxe, calme et volupté, narrowly voiding sentimentality. At the end of the song there is a momentary shift into E major which plays with the enharmonic relationship between G sharp and A flat. 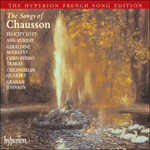 This duet is one of Chausson’s most Franckian compositions; the opening verb ‘nous bénissons’ is the key to its seraphic atmosphere—secular music with a whiff of incense. Un flot d’astres frissonne et luit. Whose cool kiss sets us free. Rest, and close your book. A stream of stars quivers and shines. We bless the sweet night.